During the past 2 decades we have witnessed a paradigm shift in surgery. We once saw a proud profession of individual accomplishment and ultimate accountability, but we now recognize that small missteps along a patient's path often represent cumulative system errors. 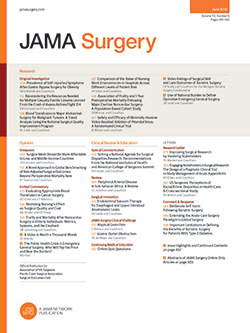 A multidisciplinary team approach has been shown to reduce medical errors, leading to better outcomes.1 Recently, the TeamSTEPPS (Team Strategies and Tools to Enhance Performance and Patient Safety) approach has been used in the operating room with good results2,3 and has been implemented in the highly stressful environment of a combat hospital with an associated reduction in medical errors.4 In 2010, Robertson et al5 adapted TeamSTEPPS for medical and nursing students as a 4-hour workshop with a structured postintervention review and observed increased knowledge regarding the beneficial effects of attitude and communication on patient safety–oriented team function. Here, in a well-written narrative, Meier et al6 show that the TeamSTEPPS model can be productively incorporated in the formal fourth-year medical school curriculum as an elective course. Moreover, they observed improvements in subjective and objective postintervention scoring across all parameters studied. We would add that, based on the findings of Hamad et al,7 the inclusion of a posttraining debriefing may further potentiate TeamSTEPPS as a useful tool in preparation for surgical residency.